Marking the end of 2006, yet another G-series exclusive hit the market, much to the delight of music lovers. 'Jewel with the Stars', an album with a set of 10 melodic numbers was released last Christmas at the Geetanjoli music store, Bashundhara Shopping Complex. With soulful lyrics and exquisite sound, the famous guitar player and vocalist of the band Miles, Iqbal Asif Jewel, came up with this album, working with some of the most appealing vocals in the country today. Being a musician, Jewel always has a lot of tunes playing in his head. It was when Nazmul Haque Bhuiyan, popularly known as Khalid, owner of G-series, proposed an album where Jewel could work on soft melodies with equally alluring lyrics, that he gave it proper thought. "He wanted me to target the mass crowd," says Jewel. "I said I would definitely try, but owing to my musical abilities and also the people I wanted to work with, I knew that the album would not reach every doorstep in the country. Every one who worked in this album has a fan base, and I wanted to enrich it rather than introducing a sudden change of image." The music arrangement, programming and the instruments were played by Jewel other than the flute, which was played by Jalal. The album was recorded at Not Of This Earth, Dream Desk and Dhoon. Jewel worked with Sumon from Aurthohin, Jon from Black, Tahsan and Russell in the album. "I have known these people for a very long time," says Jewel. "Since we have our own bands and musical obligations, it was not possible for us to really work together in an album, though I had always wanted to. Not only am I aware of their level of creativity in terms of making music, of what they can deliver, but we also happen to be very good friends." Some have claimed this album to be yet another achievement for Jewel, but others say that his instrumental album X-factor, which was released a few years ago, created a small-time revolution in the music industry in the country. In 'Jewel with the Stars', Jewel's creative work with the sound was well noted, however, the lyrics seemed to play a bigger role in the album. He worked on each composition, arranging and fine-tuning the tunes and the instruments and then worked on the lyrics for the album. In the case for lyrics as well, Jewel got the vocalists and other musician friends to write the words. "I wanted everyone to feel the theme, music and the rhythm and then work on the lyrics accordingly," he says. Nazia Mousumi Beg has written Jibon, Bhashaiya Geli and Hridoyer Anchole sung by Jon, Russell and Jewel respectively. "Nazia has been writing songs for me right from the beginning," says Jewel. "What I like about her work is that she uses very simple verses to explain something very deep and abstract. She can work on any topic and composition given to her." Ranjan, the guitarist of Arbovirus is popular amongst his friends and musicians as an amazing lyricist. He has written Anubhobe and Ishorer Osru sung by Sumon and Jewel respectively. "I have complete faith in Ranjan and his writing," Jewel exclaims. "His work goes very deep and practically touches one within. In this album, I let him be and asked him to simply work on my compositions independently. In fact, I considered a few of my tunes and compositions just to accommodate and include his expressions and thoughts." The musicians who worked in the album. 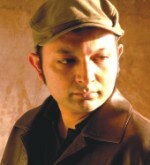 Apu, the keyboardist, composer and lyricist of the band Triloy, wrote Notun Aami, which was sung by Sumon. "Not many are aware of this but Apu is a very talented lyricist," says Jewel. "I have seen his writing before and also observed his work in Triloy's first album 'Shunno'. So, I gave him the composition and asked him to get back to me within a couple of days or so. He called back within half an hour with a rough draft of the work." Jon (Aek), Tahsan (Anontokaler Pothojatri and Phire Esho) and Russell (Aekhon Aami) wrote in this album as well. "I had them visualise some of my ideas and asked them to write based on the composition demos that I made," says Jewel. "I wanted something romantic from Tahsan in the case of Anontokaler Pothojatri, but he created something very different. I thought about it for a while before actually accepting it completely. I had to be open and realised that his ideas could very well mingle with mine." Sumon's Anubhobe and Notun Aami written by Ranjan and Apu respectively had the imagery of light, hope and a positive aura as compared to the other numbers. In this era where artistes constantly express themselves using the elements of darkness, fear, loneliness and frustration, these two numbers were well appreciated where the feeling of hope was put across. Is Jewel thinking of working with female artists for a change? "The thought has crossed my mind," he quips smiling. "Actually, I have never worked with female vocalists as such. There is a different way of working on compositions when it comes to male and female vocalists respectively, for instance the tune. I did speak to a few vocalists who happen to be some of the most accomplished female vocalists in the country. I would probably be working with them in future."